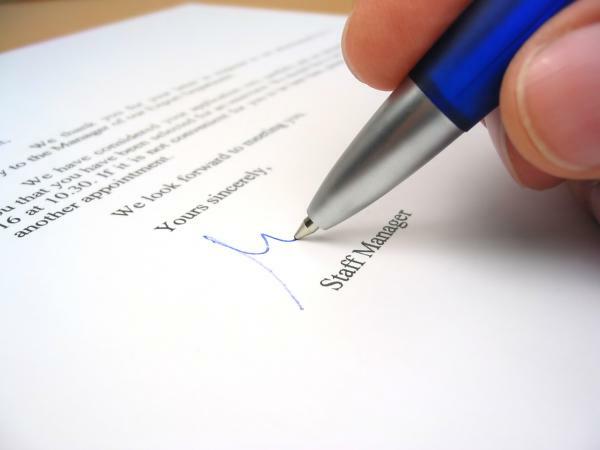 To close a business letter, it is important to summarize the key points you have made in the letter. This is also the place to request any action you expect to see happen as a result of the letter. Make it clear and include your phone number or the best way to make contact with you. This will eliminate confusion as to what is expected or how to reach you. While the last paragraph of a business letter conveys a summary of the letter's purpose, the complementary closing ties it up with a hint of formality mixed with a personal touch. This is exactly why some people feel 'stuck' when it comes to finding the right words to close a business letter. Where you place the complementary closing on the page will be determined by the letter style format used to construct the letter. If the letter is written in a block format with all lines starting at the left margin, the complimentary closing will also line up flush with the left margin. In the case of a semi-block business letter, the closing is typed to the right of center and will line up with the date at the top of the letter. At one time, it was considered improper to send a business letter by email, but that is no longer the case. For companies driven by electronic communications, an email business letter is a natural extension of day-to-day practice. If you decide to send your business letter via email, formatting changes slightly. Don't skip lines for a signature. Instead bring your typed name up directly below the closing. While the above list highlights commonly accepted complementary closings, it is also worth noting those that should not be used. Some of these may appear to be no-brainers, but others might not be quite as clear cut. The reason these closings are not used is that they are open to a number of interpretations. Another point to take note of is any closing that includes the word 'truly.' This word is now considered cliché and should be avoided. No matter which venue you choose to send your business correspondence, be sure to include your contact information. If you send a printed letter, this information often appears on business letterhead, but if not it is important to include a phone number, address and email address if you have one. Contact information in an email often appears in the email signature. An email signature is automatically added to any emails sent. No matter the reason for writing your business letter, it is important to always close the letter respectfully. Even if the letter deals with a situation in which you were wronged, it should maintain a professional and respectful tone. The closing is not the place to make angry comments. In fact, it is important to keep the tone of the entire letter professional and positive. If you feel like you need more guidance to write an effective letter use sample business letters as templates to get you started.